Fairmont Hotels is launching their 19th Annual Trees of Hope campaign at many of their locations in North America. When you book the Trees of Hope package at participating locations not only will you get a discount on your room rate and 500 bonus MileagePlus miles per night, you’ll be helping out a local charity as each still will see that hotel donate $10 (US or CAD) to it. What is Trees of Hope? light up hotel lobbies with all event proceeds going to local charities. 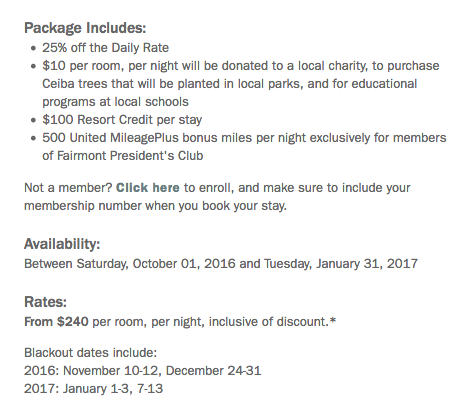 500 United MileagePlus bonus miles per night exclusively for members of Fairmont President’s Club.